Tom Courtenay in the tourist bookshop, Edward Fox by the Great West Gate, Grayson Perry chatting in the queue. Too timid to tackle such eminences, I struck up conversation with an unknown. “I’m a Larkin” he said, a cousin once removed, or something like that, come up from Truro for the occasion. His ancestor had been the brother of Sidney Larkin, Philip’s father. We trooped in and settled among the choir. I found myself next to an Arts Council fellow who’d sat on poetry committees with Larkin. Together we pointed out more celebrities. Melvyn Bragg and Alan Bennett opposite. Anthony Thwaite and Alan Johnson over there. Choral evensong celebrated the 50th anniversary of Barbados’s independence. The ambassador read the lesson, and the choir sang unaccompanied; no congregational singing for once. Psalm 78 had God repeatedly saving the ungrateful Israelites from their folly, finally knocking them into shape, picking David as ruler, and letting them live in peace and tranquillity ever after. I couldn’t see much of a link with either Barbados or Larkin; perhaps it was just psalm of the day. After the Barbadians and the public had been ushered out, the Larkin crowd moved to the south transept for the dedication. Virginia Bottomley read Solar, The Trees, and Water, Grayson Perry read from Larkin’s 23rd October 1962 letter to Monica about harvest thanksgiving, Blake Morrison gave the address (click here), Anthony Thwaite read the final verse from Church Going. Sir Tom Courtenay read Days, and Reference Back; a real actor showing the amateurs how it should be done. Someone played a recording of King Oliver’s Riverside Blues, a few prayers and it was over. 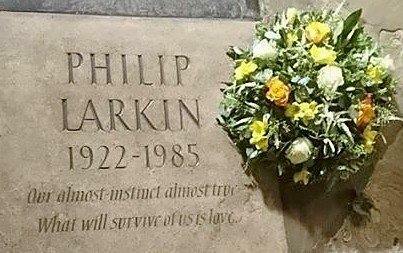 The Philip Larkin Society (click here) have been pushing this for years. Hull being City of Culture for 2017 helped. So, while Will Gompertz and the BBC filmed a piece for Newsnight, the rest of us milled about, and listened to a few more words from Professor Edwin Dawes, chair of the Philip Larkin Society, and Rosie Millard from the City of Culture. I chatted to a GP from Kent who was chair of the Thomas Hardy Society – the two societies have recently organised some joint events, and of course Larkin was a great admirer of Hardy. I fear I upset one archivist by foolishly saying I thought Larkin’s archive was in Oxford; he put me right that the Bodleian have only a few letters. But I hope I cheered up another, by getting appropriately excited when he told me he had Larkin’s lawnmower in his collection. Here is that poem. With those wonderful, terrible, unconsoling lines, “The mower stalled twice,” … “I’d even fed it, once.” … “we should be kind/While there is still time.” Yes, he’s deservedly in Poet’s Corner. I ALWAYS read your Ripe tomato’s but I liked this one on Philip Larkin especially!! Cheers Sicco, when are you next in UK? Or maybe we’ll meet at BMFMS in Amsterdam. Thanks Tony, Tom Courtenay was remarkable. The others read their poems well enough, and I’m not a great fan of hearing poetry read aloud anyway – like Larkin I prefer it on the page – but when he got going the whole atmosphere went up a gear. And without overacting. Of all the stories I found online about the December 2nd festivities, yours was the most entertaining and informative. As someone who has listened to Pretending To Be on countless occasions, no one — not even Larkin himself — reads Larkin like Sir Tom. Thanks for posting your reactions to this special occasion.